Would you wear an 80 Carat diamond engagement ring? But would you wear it? Bling it on: Choosing the right engagement ring is a balance of taste and budget – do you go for a subtle, beautifully set stone, or seek out the biggest rock on the block that falls within your price range? But now fine jewellery designer JS Diamonds has crafted an engagement ring with an 80-Carat, emerald cut diamond as its centrepiece (pictured above) and jewellery fans are, understandably, mesmerised by it. So now we have a gage on the scale of this rock, here’s a fun question; would you wear it, if you could? 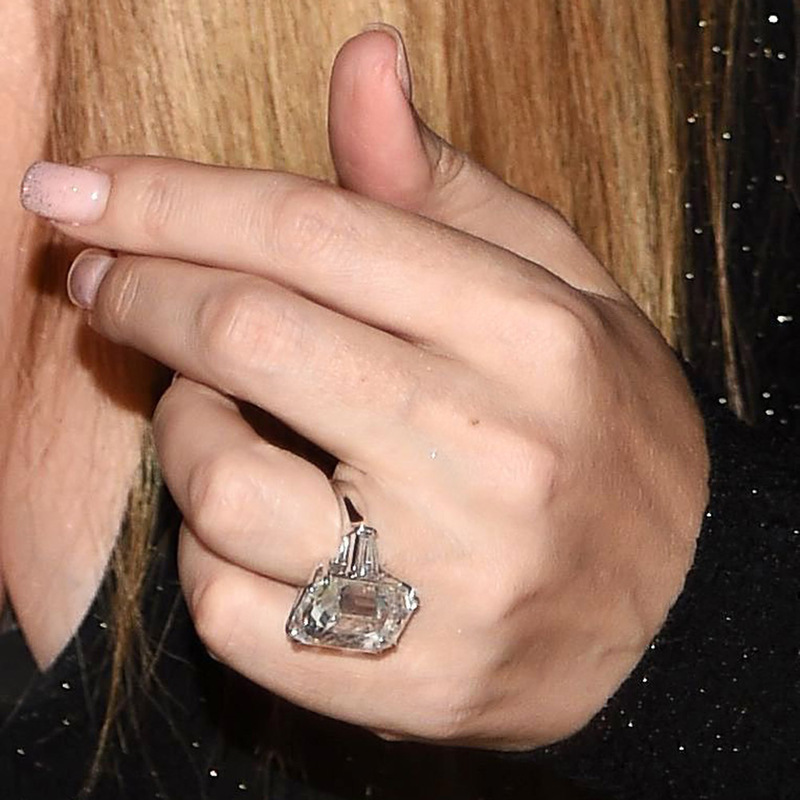 Is this really the dream engagement ring? If ‘the blinger the better’ is your motto when it comes to jewellery, then eat your heart out. Knowing that your Carat count is higher than Mariah, Kim K and Ciara’s combined would be a pretty fun statement to throw around at parties, and there’s no doubt you’re going to turn heads with this, blinding all onlookers. Also, if your spouse-to-be has gone to the effort of robbing a bank / finding that spare £10 million down the back of the sofa, then surely you’re going to love it, no matter what? That said, it’s not been that long since faux bling was de rigour (teamed with ripped denim, this look is very Jenny From The Block, don’t cha think?) and with an ice rink like that on your finger, wouldn’t everyone think it was, well, a shard of cubic zirconia? Not to mention all the other First World Problems that would arise – ‘I’ve developed a repetitive strain injury because of the weight of my jewellery’, etc. But when did our obsession with receiving bigger, better diamonds kick in? It would be easy to blame Marilyn, but it was actually a slightly cynical marketing ploy by jewellery giant DeBeers in the 1930s that got us all dreaming of #EngagementRingGoals. By the 1940s, the slogan ‘A Diamond Is Forever’ was on every billboard, and we’ve been suckers for a sparkler ever since. So what do you think of the 80-Carat engagement ring, would you wear it? Tell us on Twitter, @MarieClaireUK.